A worker at Crazy Fantasy Tattoo was arrested Feb. 1, 2013 for alleged criminal posession of stolen property, police said Feb. 27, 2013. GREENWICH VILLAGE — With electronics thefts on the rise in the Village and Meatpacking District, 6th Precinct police say they recently caught one phone re-seller in an undercover sting just steps from the West Fourth Street subway station. 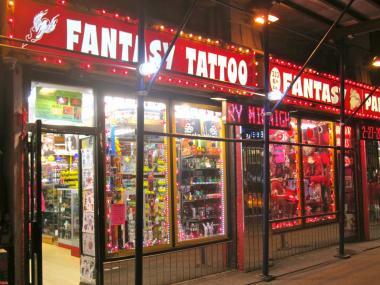 Solomon Born, 20, who worked at Crazy Fantasy Tattoo at 333 Sixth Ave. agreed to buy a snatched phone from an undercover officer, police said at a community meeting Wednesday night. "A cop came in and said, 'I just stole this. Can I sell it?' and he said yes," the precinct's commanding officer, Deputy Inspector Brandon del Pozo said. The 6th Precinct received a warrant to search the tattoo shop for stolen goods, found two allegedly snatched cell phones in a Feb. 1 raid and arrested Born, 20, police said. Police charged Born, a Brooklyn resident, with criminal possession of stolen property. Crazy Fantasy Tattoo did not immediately respond to requests for comment. The precinct is investigating other stores in the area suspected of buying and re-sell stolen electronics, del Pozo said. On the supply side of the electronics theft equation, police are warning people to guard their valuables, especially at Meatpacking District clubs. "[The thefts] are happening pretty much to females who were intoxicated at the time," del Pozo said, adding that officers had passed out 3,500 fliers at bars and clubs in the last two weeks urging people to watch their belongings. Sixth Precinct police are also patrolling in and around clubs to catch thieves and are watching club surveillance videos to identify criminals after they have pounced. The grand larceny rate, which covers the theft of goods worth at least $1,000, has risen nearly 39 percent in the precinct this year through Feb. 17 — with 172 reported incidents compared to 124 last year within the same period, NYPD statistics show.